Choose a password and store the seed in a secure place. Fund your account with your favourite currency. We do accept Bitcoin, Ethereum, Litecoin, Waves and Zcash. Copy the Waves Asset Identifier on the Token Sale page, and paste it as you can see above, then select your favourite currency pair. You can click on the sell order to get price filled in automatically. 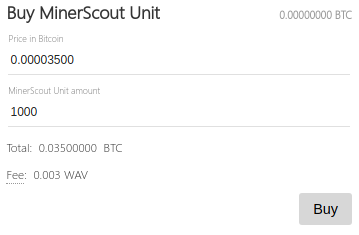 Enter MinerScout Unit amount and place your buy order.